It's time to FINALLY get organized and productive as a new faculty member! And stop feeling overwhelmed, overworked, and out of sorts every week! There are so many responsibilities new faculty members have to keep up with! And that doesn't even include the stress and overwhelm that comes with moving to a new town, adjusting to a new community, furnishing your new home, keeping track of your finances, or making new friends. When I first started as a new faculty member in the math department at UGA, I was overwhelmed, stressed, and always felt like I was falling behind in my tasks and responsibilities. I was always working after hours and on the weekend to get things done. And I would still forget stuff! Well, that was my life for 9 months...until I discovered Trello! Trello is a FREE online task management system that helps you keep track of your tasks and systems and organizes your workflows. In my own Trello account, I've created boards and lists to help me keep track of my weekly schedule, class prep, administrative duties, goals, as well as my everyday life stuff! How can Trello help you? Well, I've done all of the hard work of setting everything up for you! All you would have to do is copy and paste and you'll have all of my systems that I use to keep my weekly and daily tasks organized. You can also customize them and tweak everything I've done to fit your life and work! It's called the Faculty Toolkit! What is the Faculty Toolkit? The Faculty Toolkit walks you through how to set up Trello and customize it for optimal productivity for faculty members. The product is a serious of screenshare videos, tutorials, and templates to help you plan better weeks for yourself, every week. I know that time is precious and you don't have a lot of free time. So I created the Faculty Toolkit as efficiently as possible. It will take you less than 5 minutes to set up Trello for yourself and copy all of my boards and lists. The videos that come with the course will take about 30 minutes to watch. So you can do it during your lunch break while you are sitting at your desk. 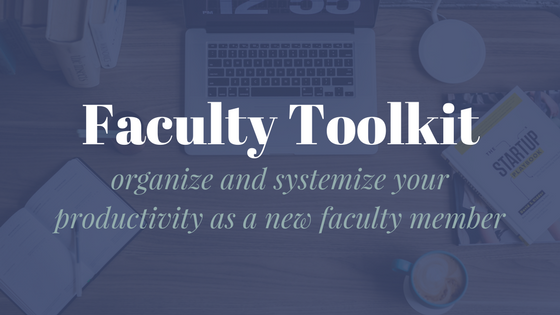 By implementing the practices in the Faculty Toolkit, you will save hours each week. Plus, you will feel so much less stress and overwhelmed! I literally take 5 minutes at the beginning and end of each day to schedule and plan within Trello and I'm good to go! Or, you could just sign up for Trello and create everything from scratch yourself. But trust me, it's so much easier to spend the $15 to have everything done for you with explanations and screenshare videos of how to use Trello. Plus, it syncs with your phone! So you can plan on the go! So, is it worth $15 to finally get organized and productive as a new faculty member?